When we select names for new roses, we make sure they match the 'personality' of that rose. The name Cutie Pie was an obvious choice for this little darling that produces some of the cutest most adorable and completely charming flowers in the rose world! With attractive larger sized flowers for its kind, this new variety is like a miniature version of the popular Hybrid Tea, which means the flowers can be displayed in small vases for indoor enjoyment. 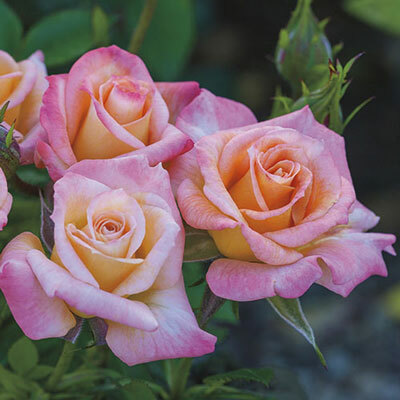 The exquisite, high-centered buds are yellow with a light overlay of pink that is delicately blended to create that delightful long-lasting peachy color. And to get even closer to perfection, the edge of each petal is kissed with a pleasing pink blush. Ideal for small spots in the landscape or even to grow in a pot on the balcony, the perfectly balanced rounded and compact plant produces an abundance of blooms on stems that are well adorned with proportional foliage.